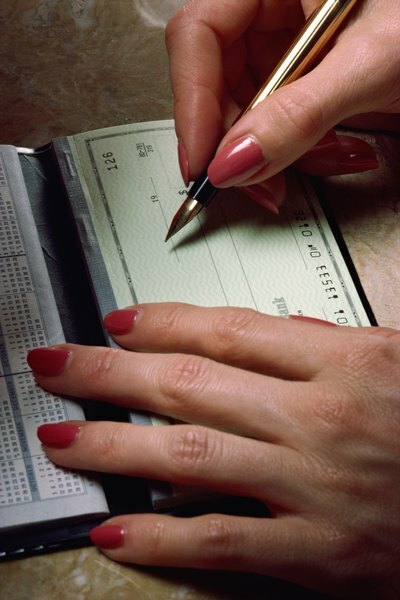 Having a joint checking account is a personal choice within each marriage. Marriage means combining belongings, responsibilities and, often, money. The decision between joint and separate bank accounts comes with arguments on both sides, but the final call comes down to your personal situation. Understanding joint checking account benefits helps you determine if you should pool all income with your spouse or keep your finances separate. A joint savings account simplifies the way you handle joint bill paying and expenses because all money is pooled in one place. You don't need to divide expenses or decide who will pay for each item in the budget. An alternative is to have a joint account for bill paying with each person maintaining other separate accounts. One drawback to this approach is the money transfer required to keep the accounts properly funded. Forgetting to transfer money to the joint account could result in an overdraft when bills are paid. One bank account means less paperwork and bookkeeping to track your spending. You'll receive only one bank statement instead of two or more if you have separate accounts plus a joint account. When you save receipts and reconcile your balances, you don't have to search through multiple statements and determine which accounts the receipts go with. A single account is easier to watch if you're waiting for checks, bill payments or charges to clear. You are able to keep all of the banking information in one file without tracking multiple accounts. Combining your finances into a single account means both partners have immediate access to the money. Neither person needs special permission to use the bank account. If one partner needs to make a payment or large purchase, she is able to access those required funds without waiting for her partner to contribute. With separate accounts, you may need to wait for fund transfers to make payments or purchases. A joint checking account can create a sense of financial solidarity for couples. Some married couples feel a greater sense of trust and unity when all of the finances are combined into one account. Partners sometimes feel all things should be shared after marriage. If one partner has a significantly smaller income or no income at all, she may feel a greater sense of control and input on the family finances with a joint account. MSN Money: Are Joint Bank Accounts a Good Idea? Times Union.com: Should Married Couples Share a Bank Account?